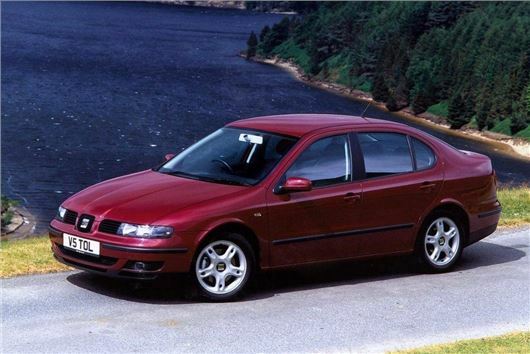 The late-1990s SEAT Toledo was never a huge seller in the UK as it sat awkwardly in the market - a mid-size saloon, from a less well-known manufacturer, that was effectively a booted variant of a much more popular hatchback model. Introduced in 1999, the Toledo was effectively an elongated Leon, with all of the extra length built into the luggage compartment. The boot was admirably huge, but the sales potential wasn’t, as British buyers had long since embraced the hatchback as the compact car body style of choice. Over six years, SEAT shifted fewer than 3000 Toledos a year. Of those, around 15 per cent were something markedly different - the Toledo V5. Powered by a 2.3-litre engine developed for the Volkswagen Golf, the unusual configuration gave the Toledo a lovely, warbly exhaust note, along with a respectably decent turn of pace; 0-60 in 8.3 seconds and a top speed of 140mph weren’t to be sniffed at, but then, this was a car with a lively 170bhp on tap. Imagine that - the same power output as a Ford Focus ST170 packaged into a car that looked like something you’d hail outside the kebab shop on a Saturday night. It was a fairly well-sorted driver’s car, too. SEAT had learned a lot with the Leon 20v Turbo and Cupra models, and some of these parts found their way over to the sister car, namely the firmer dampers and faster steering rack, although the V5 retained a higher ride height and longer suspension travel. There was a reason for that - the V5 engine was tall and narrow, meaning it sat low in the engine bay. Many an enthusiast who has fitted coilovers or lowering springs to a V5 Golf will tell you that the first thing to whack a pothole is the car’s sump, and that, folks, is not very good news. Indeed, that’s one of the reasons that Toledo V5s don’t come up for sale very often. People who like them keep them. The other is that there weren’t really that many to start with - fewer than 1,800 were sold in the UK in total, and of those fewer than 250 remain taxed. Taxing one isn’t cheap, either - the V5 emits 211g/km of CO2, putting it into the same road tax bracket as a Jaguar X-TYPE V6 or a BMW 330i. Then there’s the fuel consumption - SEAT’s official figure was 32mpg, but around town you’ll be lucky to see 20mpg. So why, then, is the Toledo V5 such an intriguing proposition? First, it’s an oddball, and we like cars that don’t conform. Second, it’s a cracking car to drive, and those high running costs, coupled to the fact that not many people know what it is, mean that used prices are devilishly cheap. Scouring the small ads, the cheapest example we found was just £295, with four months’ MoT, while if you’ve got £1000 to spend then apart from the examples already cherished by enthusiasts, you can pretty much take your pick. I have had one since new, totally reliable but only has 50k on it. Local mechanic always says the car shouldn't be as much fun as it is, but wow isn't it great. 24mpg if hooned, and 27 if driven carefully but on the open road driven like a saint you can see 45mpg..